I've found grilling fish can sometimes be a discouraging experience for many people, me included. Is it undercooked, overcooked, plain or seasoned, do I spice it up or not? All very good questions many of us have asked when it comes to grilling fish (or more often than not, losing it between the grill and down onto the burner). That's why I was eager to fall back on my old tried and true cast iron pan recipe I've used on Walleye (Pickeral) for 25 years without fail. I've adapted this new crispy grilling style from that old method and I may never do it any other way again. I've modified the original cast iron pan method a bit, I'm using butter instead of egg, and I decided to add some Franks Red Hot sauce to the butter. 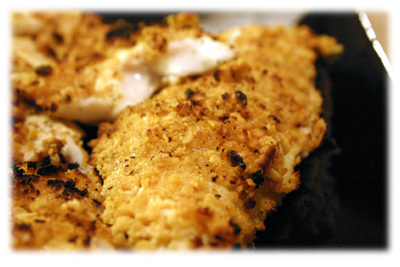 4 white fish fillets - consider Halibut, Haddock, Walleye (Pickeral), Cod, Tilapia or your favorite. Place the crushed soda crackers on a large plate. Stir in the garlic powder and pepper until well mixed with the crackers. 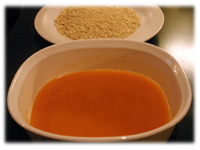 Melt the butter in a shallow wide bowl and stir in the hot sauce until well blended. 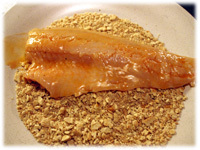 Place a fillet in the melted butter mixture and flip several times to ensure it's well coated. If it's well covered in the butter the crackers will stick to it better. 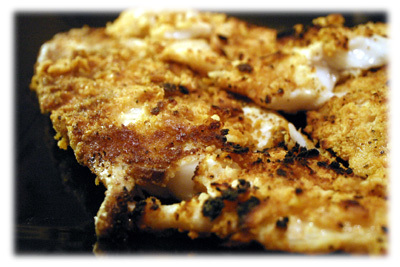 Place a piece of butter coated fish on the crackers. Scoop some crackers on the top of it and press the piece down into the crackers. 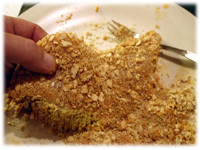 Flip the fish over and make sure all sides are well covered with the crushed crackers. Clean and oil the grates well and preheat the grill to 600F - 625F. When the BBQ reaches temperature lift the lid and put on the fish. Here's where you've got some choices when grilling fish. Use an enclosed basket. 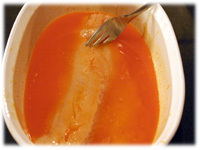 This works really well provided the fish is thick enough to fill the basket and not fall apart when flipping it. Also, you can't really close the lid of the grill with the handle sticking out as it forces one end of the basket to lift up off the grates. 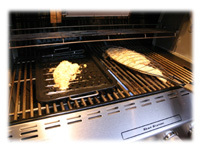 Use a perforated grilling pan on top of the grates that's well oiled before putting the fish on it. I tend to use this method most often when grilling like this. Denser fish like tuna or salmon go right on the grates. After 4 to 5 minutes of grilling *roll* each piece over very carefully with a spatula. Another 4 - 5 minutes grilling and the flesh should begin to flake apart easily with a fork. 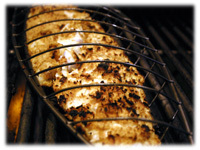 As soon as you think it does get the fish off the grill - it will still cook a bit more as it rests. Serve immediately with any of the easy grilled vegetable recipes and rice.